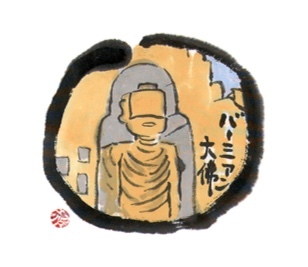 Emperor Shomu promoted construction of provincial temples throughout Japan in order to eliminate social unrest of that time, such as repeated political changes and riots, with the power of Buddhism (idea of nation protection). On the other hand, the emperor decided to build a Great Buddha. 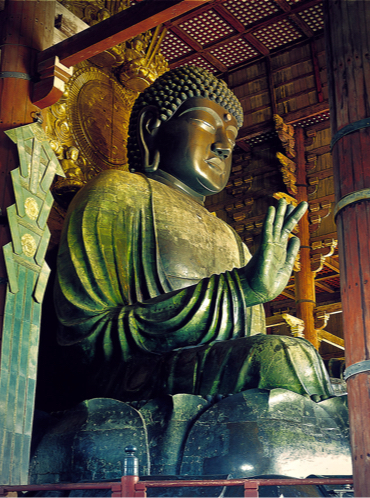 As the principal image of Todaiji Temple, the construction of the world largest gilt bronze statue of Vairocana was started. In 752, the ceremony for opening the eyes of a newly-constructed image was conducted with great eclat. ◇ Vairocana means the sun or light in Sanskrit, and is the founder of Avatamsaka Sutra. Mahavairocana (Dainichi Nyorai) regarded as the Primordial Buddha of the universe in esoteric Buddhism in the Heian period is the Buddha developed from Vairocana. Buddhism is the teachings of Sakyamuni born as a prince of the Sakyas living on the border between India and Nepal in the 6th century B.C. (or the 5th century B.C.). When he was young, Sakyamuni became a priest, deeply worried about the life, aging, illness and death of man. Through self-mortification and meditation for about 6 years, he became awakened as Buddha. He spread the teaching that everyone has a possibility to become an awakened one, as well as the way to Buddhahood (spiritual enlightenment). At that time, Japanese people lived in pit-houses, hunting animals and collecting plants, which is called the Jomon period. Sakyamuni preached the teachings for 45 years, and passed away at the age of 80. Then, his disciples spread Buddhism throughout India. Around 270 B.C., Emperor Ashoka of the Maurya Dynasty recommended Buddhism, and it became widespread. It is said that Buddhism came down to Japan in 538 (or in 552) from Baekje via Gandhara and Bamiyan through the Silk Road. ◇ The Shakya formed a tribal state in the southwestern part of Nepal, a small country located at the foot of the Himalayas. The birth place of Sakyamuni (sage of the Sakyas) is Lumbini. ◇ Sakyamuni (sage of the Sakyas) means a noble man in the state of Shakya. His real name is Gotama Siddhattha. ◇ Buddha means Gotama Siddhattha or awakened one. ◇ Nyumetsu means entering Nirvana or the death of Buddha. ◇ Kleshas mean earthly desires that physically and mentally annoy and harass man. ◇ Gandhara is a provincial area of Pakistan today. ◇ Bamiyan is a provincial area of Afghanistan today. ◇ Baekje is the mid-west part of the Korean Peninsula today. After its introduction, Prince Shotoku and other national leaders spread Buddhism. 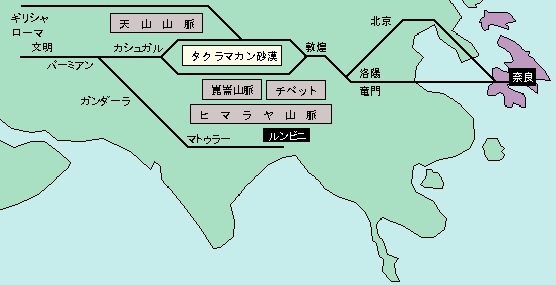 Soon after the relocation of the capital from Fujiwara-kyo to Heijo-kyo, political changes, disputes among imperial families, epidemics, and natural disasters frequently occurred. 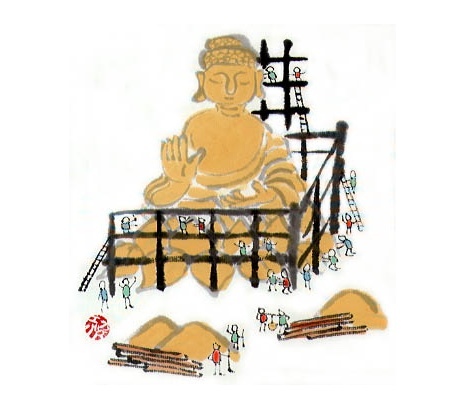 In 741 (the 13th year of Tempyo), Emperor Shomu issued the imperial decree to construct provincial temples, thinking that the power of Buddhism would save the country by building a statue of Buddha and a seven-story pagoda in each province. ◇ Imperial decree to build provincial temples: Constructing a temple in each province (there were 62 at that time) together with a provincial nunnery for the protection of the nation. Statues of Buddha were produced for the first time about 500 years after the death of Sakyamuni. At first, Emperor Ashoka spread stupas, in which ashes of Sakyamuni was placed, as objects for worship. Before long, people began to worship Sakyamuni not as a human figure but as symbolized sacred trees (lime trees), sacred platform (pedestals) and so on.It is said that human-shaped statues of Buddha were produced due to the influence from the Hellenistic culture during the expedition by Alexander the Great. 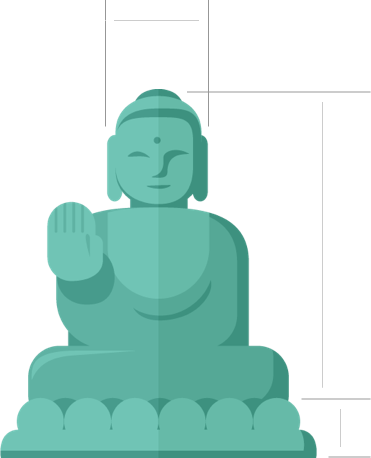 In the 1st or 2nd century A.D., statues of Buddha were born in Gandhara and Mathura, India, which came down to Japan along with Buddhism via the Silk Road. It is said that the Great Buddha of Todaiji Temple was modeled after Mahavairocana of the Housenji Temple in Luoyang, China. The Great Buddha was constructed as the principal image suitable to Todaiji Temple as the hub of Buddhism for the protection of the nation. ◇ Alexander the Great was a king of Greece, who conveyed the Hellenistic culture during the expedition to Northwestern India. ◇ Hellenistic culture is created through the interaction between the Greek and the Oriental cultures. ◇ Mathura is the central part of India today. ◇ Longmen Grottoes were constructed from 494 during the Northern Wei period to the Tang period so as to house approximately 90,000 statues of Buddha. ◇ Hosenji Temple is famous for its Great Buddha built around 675 during the reign of Wu Zetian in Tang China. 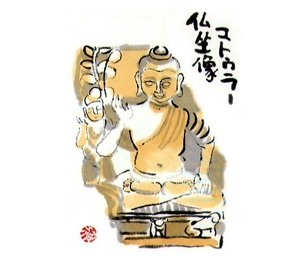 In 752 (the 4th year of Tempyo-Shoho), the ceremony to consecrate the Great Buddha by inserting the pupils with a brush called “Daibutsu Kaigan Kuyo-e” was held. The officiating monk was an Indian priest named Bodhisena. At the ceremony, interesting overseas music and dancing mainly from China and Korea were performed. The ceremony became the largest international event in East Asia at that time. Todaiji Temple was expected to widely research the religious principles of Buddhism, in addition to playing a role to protect the nation. 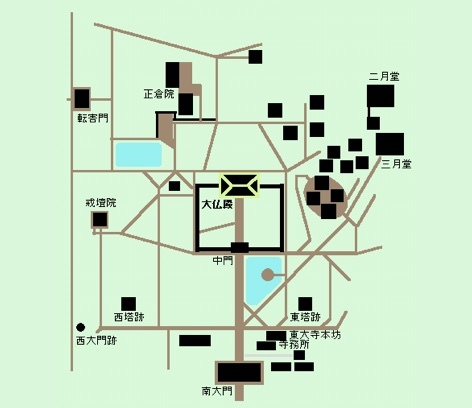 The temple organized a system to study the six sects of Buddhism in South Capital (Nara), including Kegon, Hosso and Sanron. As a temple to simultaneously study the six sects, it functioned like a national university today. The Kegon sect was emphasized the most, and the Vairocana-Buddha of that sect was placed as the principal image there. However, due to a big earthquake in 855 (the 2nd year of Saiko), the head of the Buddha fell down. In addition, in 1180 (the 4th year of Jisho), the Great Buddha Hall was burnt down when Taira no Shigehira set fire to the South Capital during the battle between the Minamoto clan and the Taira clan. The hall was reconstructed soon, but it was burnt down again during the war in 1567 (the 10th year of Eiroku) during the Sengoku period. 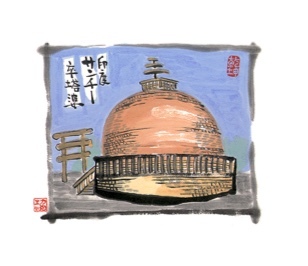 Then the Great Buddha exposed to rain was repaired, and in 1692 (the fifth year of Genroku), the ceremony to consecrate the Great Buddha was held, followed by the ceremony to celebrate the completion of the Great Buddha Hall called “Rakkei Kuyo” held in 1709 (the 6th year of Hoei). Then, after the order to separate Shintoism from Buddhism (policy to regard Shintoism as the national religion by separating it from Buddhism) issued in 1868 (the 1st year of Meiji), all temples in Nara declined, and people did not pay attention to the Great Buddha Hall. Under these circumstances, the Hall was demolished for repair. Since another “Major Repair in Showa,” the Great Buddha and its Hall have been maintained well until today.